According to the American Cancer Society, more than one million people get cancer in the United States each year. The diagnosis is often a major physical, emotional, social, and spiritual blow, capable of shaking patients to their core. This empathetic guide coauthored by cancer survivor Dr. Alan Wolfelt helps individuals understand and cope with the many difficult thoughts and feelings to which a cancer diagnosis can give rise, assisting them as they find ways to experience peace and joy throughout their journey. 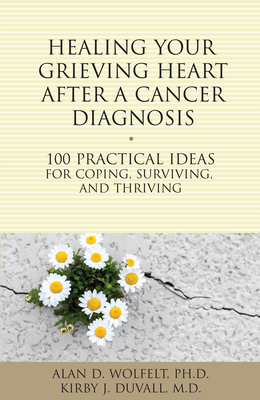 Among the 100 ideas for surviving and thriving in this book are those that explain the basic principles of grief and mourning and how they apply to a life-altering, life-threatening, or terminal medical diagnosis. Others offer instantaneous, in-the-moment suggestions of things that cancer patients can do immediately in order to express their grief and live with meaning in each moment. This book is a calming companion for people battling cancer and their loved ones.